Who can use this Agency Agreement? Any manufacturer or supplier of goods or services can use this agency agreement. What is this Agency Agreement for? 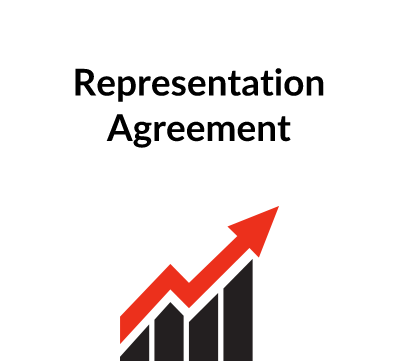 The agreement sets out the terms on which the “principal” appoints the agent to find buyers for its goods and services on an exclusive basis in a defined territory. This version is written from the point of view of the manufacturer or supplier – the principal. For a bias in favour of the agent please see template A102. Scope of agreement: it will identify the goods or services that the agent will sell and the area in which the agent operates – the territory. The duties of the agent: these may include producing marketing literature, arranging submissions and providing after sales services as well as the basic task of finding buyers. Commission arrangements: not just the percentage but also frequency of calculation and payment. There may be special arrangements for sales made outside the territory where the agent was involved in procuring the sale. Targets: it is useful to fix an annual target for the agent against which you can measure performance. This can also be useful when dealing with a compensation claim if you decide to dismiss an agent the poor performance. Duration & Termination: establishing a successful agency is not necessarily a short-term activity and you need an agreement that is long enough to enable the agent to get properly established and bringing decent returns. As for bringing it to an end, beware: you may have to pay compensation even if the agent is not performing well. The rules vary in different countries, so be sure to check. What detailed terms does the Agency Agreement contain? a general clause detailing indemnity, assignment, subcontracting, waiver, severability, language, resolution of disputes and governing law. This appointment of an agent is designed to be compatible with EU law and has recently been updated. This version is written from the point of view of the manufacturer or supplier – the principal. For a bias in favour of the agent please see template A102. ContractStore supplies templates and is not a law firm. But all our templates are written by experienced lawyers. This one was written by the co-author of Exporting Made Easy. We can arrange legal assistance for customers who need special terms in one of our documents or a bespoke template. . For more information see our Legal Services page. 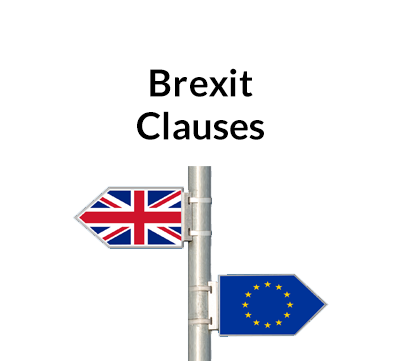 Protect your European contracts with Brexit clauses and avoid business disruption when Britain leaves the EU. Use our templates to avoid a bumpy Brexit. 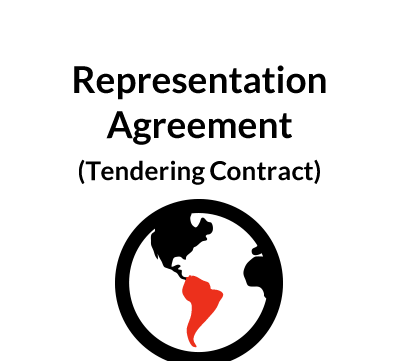 When this template is used as a cross-border agreement, the Principal should have the text checked by a lawyer in the Agent’s territory even if the Principal wishes to use the law of his own country as the governing law of the Agreement. Within the European Union, there is a Council Directive which governs aspects of agency appointments and in the UK, this Directive was implemented by the Commercial Agents (Council Directive) Regulations 1993. This can be found online at http://www.opsi.gov.uk/si/si1993/Uksi_19933053_en_2.htm. There is also a free document on our website summarising the main provisions of the law (Z163). DATE AND PARTIES – see our separate note on signing contracts signing contracts. In the case of the parties, the official address of each of the parties should be inserted and where the Agent operates under a P.O. Box number, a physical address might also usefully be included. This confirms the appointment of the Agent on an exclusive basis – i.e. the Principal, by appointing this Agent will not be able to appoint another Agent for the same products in the Territory. If a non-exclusive agreement is required, the wording should be changed to make this clear. Alternative B may suit a Principal with a lower volume of sales. 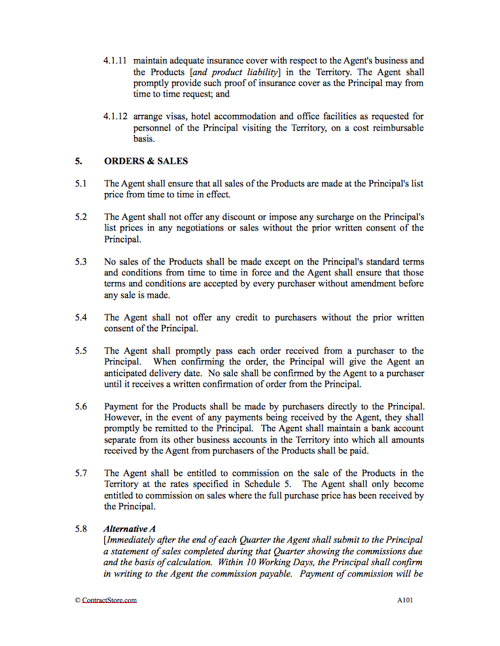 This places the onus on the Principal to advise the Agent of sales completed and commission due. Again where the Agent carries on business outside the EU the time allowed for payment may be longer. Under EU legislation there is provision for the Principal to pay either compensatory damages or an indemnity to the Agent unless termination is due to a material default or insolvency of the Agent. It should be noted that this right to compensation/indemnity will also arise where the Agent terminates by reason of ill health/old age or by reason of the Principal’s conduct. There is more information in a free download on our website, document Z163. The Principal should seek legal advice as to whether compensation or an indemnity best suits their particular circumstances before the Agreement is signed and whether or not to include specific terms in the Agreement rather than have it drafted as in our form. It is worth noting however that an indemnity has the advantages of certainty and ease of calculation over compensation but it still allows the Agent to bring legal proceedings to recover damages from the Principal. Under EU law, claims for compensation or indemnity must be made within 12 months of termination. 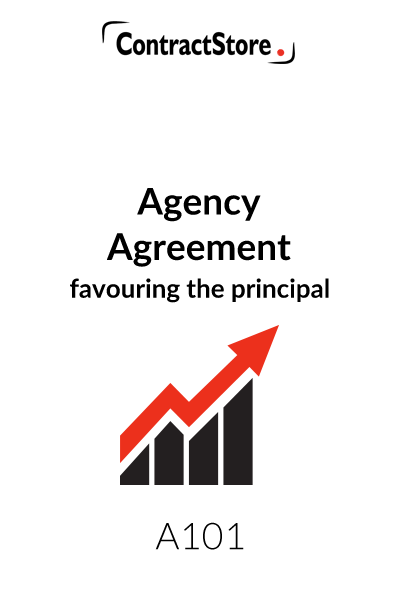 This is intended to restrict the Agent from competing with the Principal’s business both during the Agreement and after it has been terminated. The period covered by this clause must not exceed 2 years under EU law. In clause 11.9 we have suggested direct negotiation followed by mediation (if agreed) and, ultimately, arbitration in the event of disputes. For other standard clauses and for a more detailed discussion of dispute resolution, see the free document (A140) on our website.